With the incredible advances in technology that have taken place over the last decade, even the most unimaginable options and features are becoming widely available. From fingerprint and voice projection technology, all the way to devices that assist with home improvement and lifestyle, the scientific community are making new breakthroughs to rival even alien technologies as depicted in Hollywood. 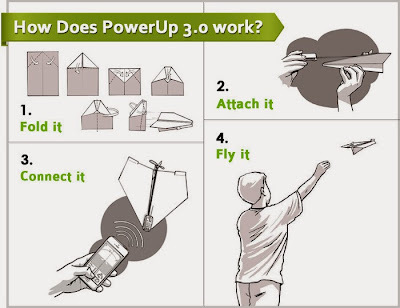 One of the most amazing inventions to date and created solely from recycled components, paper and PCBs is the recently created Paper Airplane that can be controlled by a soon-to-be available smart phone app. Its creator, Shai Goitein, one of the world's most recent inventors, has teamed up with smartphone gadget-maker company TobyRich and unveiled their new project Kickstarter, which intends to provide fantastic new creations for consumers around the globe. People are lining up to place an order for this amazing piece of technology. Unfortunately it isn't due to be available in time for Christmas 2013, but is expected to be on the shelves as of early next year. Developers say that for a mere $50, people can have access to one of the hottest new technological masterpieces to have been released in several years. The KickStarter project supports charities worldwide and with the release of this product they intend to raise $50,000 in support of global events and profits. The fund-raising period is due to end on January 25th 2014 so there is still plenty of time to place an order and help the project to reach its goals. Being made of entirely recycled materials, from the thick paper used to create the 'stealth-bomber' styled airplane, all the way to the electronic circuits and components powering the PCB and gadget, the invention allows direct control of the vehicle via the use of a mobile phone app that can be downloaded from most app stores. The app works as a remote control, affording the user complete control of the small vehicle to whizz, whirl and swoop past amazed onlookers. Being made of paper, the airplane is expected to be prone to being caught in gusts of wind as it relies on a small propeller at the rear of the vehicle. A strong aluminium rod connects the propeller to the robotic hardware and a small antenna provides the signal between the airplane and the mobile device's app. 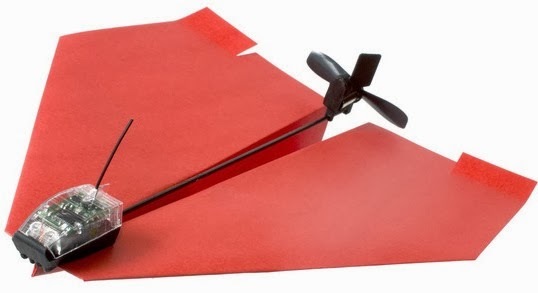 With the ability to fly in straight lines, lean left and right as well as slow down and speed up, the paper airplane is so much fun to watch, let alone operate that it has been branded as one of the potential leaders in the gadget industry for 2014. When it comes to ruling the skies, don't expect this airplane to be able to house any machine guns or missile launchers; any more weight and it will sink before gliding. But with a promising career ahead of him, Shai Goitein provides reassurance to consumers that they can put down their sky phone number, KickStarter has it covered from here. For a great technological gift due to be released worldwide in the new year, keep a close eye on the KickStarter project and don't miss out on this great gadget. Melody Cleo is a passionate blogger from Manchester, UK. In her free time, she writes articles on various topics such as technology, gadgets, travel...etc. As of now she is focusing on Sky Contact Number, which provides information regarding broadband services, radio services and television services.